For Fisher Price toys from pre 1980 click here. 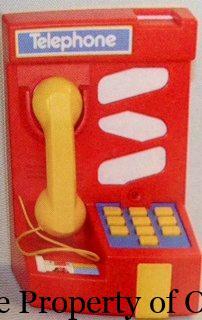 Who can talk about an 80s childhood without mentioning gentle toy giant Fisher Price? I remember loving the airport, car garage and kindergarten sets I got to play with at day care and the barn and animals at home. No smartphone today has the appeal of the wheeled Chatterphone and that quintessential baby gift the ring stacker is still going strong. 80s kids may remember the Puffalumps dolls but not know that they also came from Fisher Price as did the Dream Dollhouse and the McDonald’s fast food play sets. Fisher Price had 3 founders in actuality but only the 2 male founders Herman Fisher and Irving Price made it onto the name. The 3rd member of the team was Helen Schelle who heavily contributed to toy design. Founded in 1930 in East Aurora, NY under the name Fisher-Price Toys which nearly changed to Fisher Toy Company in 1932 but ended up being too expensive to change. In 1935 wooden Disney pull-along toys are introduced into the market following up in 1941 with an American Airlines flagship that marks the first advertising toy for the company. The 1940s see a lot of change as FP shifts toys production to military items in support of the war and halts toy production altogether in 1943. 1946 sees the toys return to the line with new toy lines being produced. 1950 sees in the birth of plastics used in FP toy production. The Musical Push Chime also debuts this year and is still in production today. 1957 brings in toys still going strong today- the Xylaphone, Corn Popper and Snap-lock beads. These are followed in 1959 by the Play Family line which eventually becomes the Little People line. The ever-popular Chatterphone debuts in 1961. 1968 sees a change of hands when Quaker Oats takes over FP and increases toy production, resulting in the first Play Family set, the Play Family Farm. Mooo! The 1970s bring about the production of FP staples children will be playing with well into the 80s and beyond: Music Box Record Player, Baby Activity Center, Chime Ball, Rock-a-Stack stacking rings, Play Gym, FP trucks, Adventure People, Dollhouse, Phonograph. 1980 marks the 50th anniversary of the company’s birth with 300 limited edition Dr. Ducks reissued. Popular lines of the 80s included Construx, baby furniture, Little People, Puffalumps. Fisher Price acquires Hestair Kiddicraft and changes its name to just Fisher-Price. 1990-2000 sees company growth and independence: Quaker Oats separates from Fisher-Price and Mattel takes over, then acquires Kransco who will go on to manufacture Power Wheels. Mattel then acquires Tyco Toys who will produce ViewMaster and Magna Doodle for Fisher-Price. At the end of the decade Fisher-Price Brands is born out of a merger with Tyco Preschool Brands.